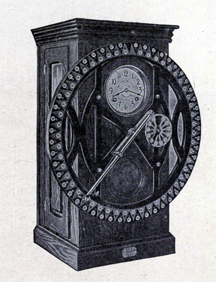 An old-fashioned punch clock, described by Halbert Powers Gillette (1869-1958), an American engineer, in a 1909 book. The distinction between personal time and work time is still debated. In a recent case before the US Supreme Court, IBP v. Alvarez, workers won the right to be paid for "donning and doffing" time — the time spent putting on and removing special garments required by the employer. IBP had claimed that they needn't pay workers for this time, nor for time spent walking from the locker room to their workstations. Photo courtesy Wikipedia. General rules are usually helpful, because they simplify life. But when we accept them uncritically, and apply them unquestioningly, we risk eliminating valuable choices that, if exercised, could transform our lives for the better. Here's a small collection of workplace maxims that too many of us are a little too willing to accept as true. If it didn't work here, we did something wrong when we tried it. If you read it in a book, it must be true. The value of a consultant's advice is proportional to the consultant's fee. If it's logical, and internally consistent, it will work. People always pad their estimates. Never give them what they ask for. Working smarter is easy. That's why we tell people to work smarter not harder. Managers are people who couldn't hack it doing real work. Executives are people who couldn't hack it as managers. The cure for our financial problems isn't better products, or more revenue, or new investment, or training people, or listening to customers — it's reducing expenses. Making people compete for bonuses, raises, perks, honors, or promotions won't hurt our efforts to create high-performance teams. How we dress is at least as important as what we do. Anyone's total output is proportional to the hours they work. To increase productivity, don't let people use company facilities for private purposes. just isn'tI have a right to appropriate company resources for my own ends. With the right technology, we can go paperless. We don't need people to deliver training — computer based training works just fine. Eliminating theft is so important that the cost of controlling it doesn't matter. The typical female executive and the typical male executive manage altogether differently. Male (female) executives are more ruthless than female (male) executives. Workplace violence will never happen here. People who play politics don't really have anything of value to offer. The best person to hire for this job is someone who has done it before. People can get so angry that they "snap," like twigs bent too far. Meetings are almost always a waste. The only way to keep us all up to date is a weekly meeting. Organized people are more effective. Share price is a valid measure of the company's health. Significant innovation always requires a visionary champion. Would you like to see your comments posted here? rbrenDxiFjKkFFsoXCVFBner@ChacyaPtGavaSHZwyLcWoCanyon.comSend me your comments by email, or by Web form. See also Workplace Politics, Critical Thinking at Work and Managing Your Boss for more related articles. I offer email and telephone coaching at both corporate and individual rates. Contact Rick for details at rbrenUqndJxksKSUmSYkKner@ChacxJXbVFjSNBMPNxkvoCanyon.com or (650) 787-6475, or toll-free in the continental US at (866) 378-5470.